We know that QuickTime movies (MOV format) can be played in QuickTime Player and WMV video (WMV format) played in Windows Media Player. But we may have no idea about which player can play MVI files. MVI format is produced by most digital still cameras, which are capable of shooting a limited amount of video, and because there is no tape, it is saved as an MVI file format. However, the MVI file format is not compatible with other programs. So you may have problem to play, edit or use these digital videos. Aunsoft Video Converter - a very great and powerful MVI Converter, which is good at converting your MVI files from your digital still cameras to MPG, AVI, DV, MPEG, WMV, MOV, MP4, 3GP, VOB, DVD, etc without losing quality, then you can play them on your iPod, iPhone, Archos, iRiver, Nexus, Droid, Zune, Media Player, Quicktime, iTune, etc, or edit them in Movie Maker, Sony Vega, After Effects, Adobe Premiere, Avid, iMovie, FCP, FCE, etc, or upload to YouTube, Google, Yahoo, Hulu, Myspace, etc. Now follow the steps, you could convert, edit and play MVI files fast. Step1: Free download, install and launch MVI File Converter. Step2: Drag and drop or click “Add” to load MVI videos into the program you want to convert. You can add more than one file at a time. Step3: In the drop down list menu of “Format”, please select the output video format you want to get. You want to convert MVI to MP4, please select MP4, like to convert MVI to MPEG, please select MPGE, demand to convert MVI to AVI, just select AVI, etc. Then specify a location on your computer where the new file should be saved. 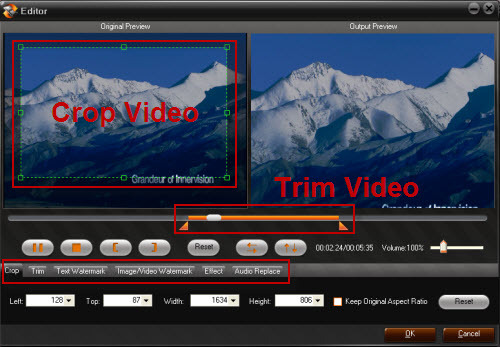 Step4: If you want to trim or crop your MVI files and get the wanted part or area, if you want to replace original audio and add background music to the MVI videos, if you want to deinterlace, remove interlaces or image noises of the videos, please click “Edit” to get into editor windows and start your DIY process. Step5: Click “Convert” to begin converting the MVI files. If you want to know more about converting MVI files, please enter: Convert, Edit and Play MVI files.